Black & White: The miracle of Sibu!!! Thank you intelligent Voters of Sibu. 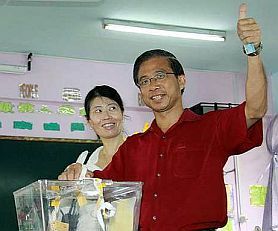 After much unwarranted delay and "you know what" tactics, DAP won by 398 votes. 398 votes!!?? Do you believe this? Are we so stupid to believe this? And a surprise...why no call for a recount?? BN is so magnanimous????? Never mind. We, the rakyats of Malaysia win!!! Let there be hope for a better government for the people!!!! Not only intelligent but BRAVE! Imagine going to the polls in flood waters but still have the determination to disregard the flood-mitigating promises of the PM. We need a stronger opposition forces to keep the ruling elite from west Malaysia hold on to absolute political power in east Malaysia, it is for our own good as the saying go, " absolute power means perpetuate corruption" - NO TO CORRUPTION in this election . Yes I should use "Courageous voters of Sibu!" Yes, let's "withdraw before maturity" all the "fixed deposits" of BN in Sabah and Sarawak. In fact they are long overdue!! Those hand out money only constitute less than ten percent of the vast oil fortune west Malaysia ruling elites stolen from the east Malaysians, now the 1 Malaysia proponent is giving it out to the Chinese, instead of using the fund for the development of Sibu ... Go figure!! "398" is a miracle number by itself. It sounded like 'shang kao fatt' in cantonese. Good omen ya, miracle. Actual majority is more than that, they know it. Simple, 'they' control some votes at whim & fancy. It's always a relief to hear from you after such a long "elegant silence!" Maybe you have been too busy at the other site..."Talk only,and still in that bankrupt party!" At least Sarawakian from Sibu manage to see through the $$ handout to Chinese during election campaign is low standard to them, they rejected this type of politicking by voting a DAP candidate to victory. It just shown that racist ruling elite's from west Malaysia's way of conducting their political affair in east Malaysia is just as repulsive as the picture shown! Bankrupt party? It is dead walking corpse. Genuine good ideas are still bad if no one adopts. Walking corpse is dead and can never bring life to it. Walking corpse must be spreading stinking smell and diseases to all who go near it. Those who associate with it must be of the same league, smelly and disgusting. Some have changed into arrogant devils. Quite true, unless he or she wears surgical mask and put on glove all the time. Then, I believe it's ok but no guarantee.